Note: We completed this way before we knew the gender of our baby, so don’t think that had an effect, or should have an effect on our decision. Also, excuse the laundry and non-vacuumed floors in the photo. This is true life y’all. So, this may not be your cup of tea-but when we found out we were expecting another, we decided to make the nursery for both of them. Yes, sharing a room. Here’s the thing, our kids only sleep and get dressed or changed in there. They have a play/learning room, a play area downstairs and outside activities. They don’t need much in the actual bedroom quarters. So, in my true fashion, I stalked Facebook FSOT sites and craigslist for a toddler bed for James. We were blessed because a friend was selling her’s that was put together and was never used!!!! Score!!!! We put the crib by the window (James needs zero distractions or items to break) and the toddler bed on the opposing wall. We also purchased a changing table (no, we didn’t have one before) that was in excellent used condition, with great storage, and that shares the wall with the crib. 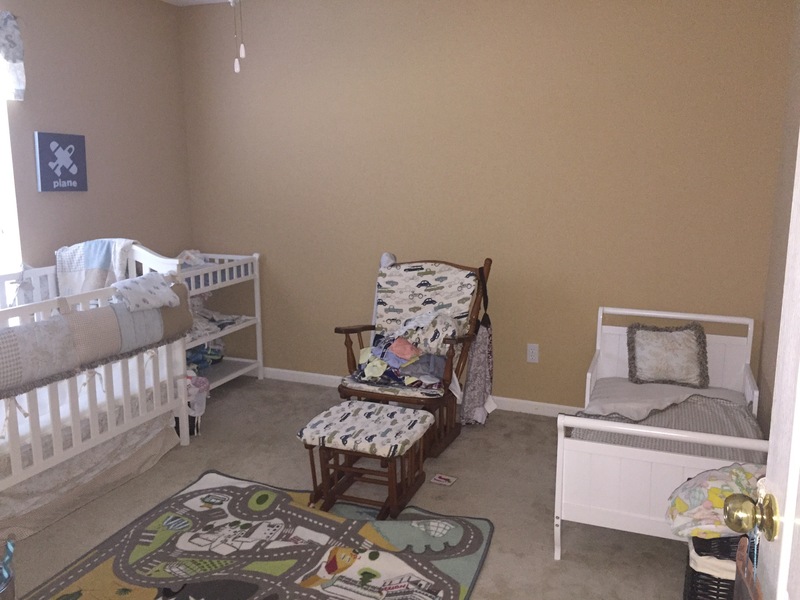 We separated the room with the glider I re-did for nursery in 2014. We kept the dressers that were in there (still waiting on my wall mounts, IKEA) just consolidated items for both kids. Above the dresser, will be an accent wall of photos of the kids. For the closet, we decided to get this organizational system and add another shelf so each kid will have two hanging sections. Viola, $80 and very little time later, we’ve got a nursery for 2.